Designed for exceptional photo reproduction, brilliant graphics and sharp text. Print-to-the-edge full-bleed capability for high-impact design. Ultra-fine perforations allow clean and easy separation. 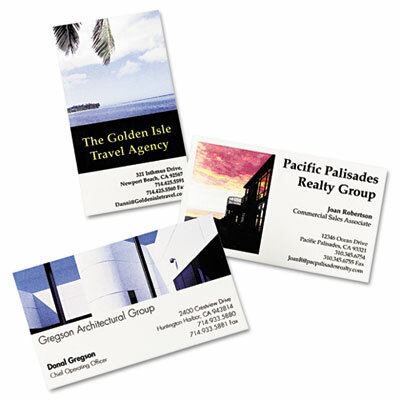 Achieve exceptional photo reproduction, brilliant graphics and sharp text with the high-quality heavyweight stock and special gloss coating of these business cards. Offers print-to-the-edge full-bleed capability and for high-impact design. Plus, only Avery, a Microsoft® Gold Certified Partner, offers so many FREE easy-to-use design and print solutions. Ultra-fine perforations allow clean and easy separation. Each card: 3 1/2 x 2.